Home » Calendar » Webinar: How Well Can Heat Pumps Work For You? This FREE webinar will focus on the findings of the completed final reports from the evaluation of two recent projects on the topics of Air-Source Heat Pumps and Gas Heat Pumps. This project analyzed the operation of an air-to-water gas absorption heat pump installed at the Archetype Sustainable House in Vaughan, Ontario, over the 2017 cooling season and 2017/2018 heating season. The primary goal of the research was to create a detailed map of the heat pump’s performance across the range of outdoor conditions experienced in a Canadian climate such that energy, cost, and carbon reductions associated with the heat pump could be estimated. Electric baseboards are the main heating source for 24% of all multi-unit residential building (MURB) and rowhouse units in Ontario. 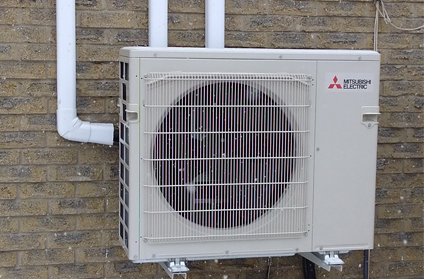 In this sector, heat pump retrofits represent a significant opportunity to conserve electricity, reduce carbon emissions and reduce operating costs, while simultaneously promoting tenant comfort and safety. This case study evaluated the performance of ductless multi-split air-source heat pump retrofits in a rowhouse complex located in Brantford, Ontario, during 2017/2018.